Rayadah Investment Company is building King Abdullah Financial District (KAFD), a 1.6 million square meters (sqm) real estate development located north of Riyadh. KAFD includes the Saudi Stock Exchange (Tadwul), the Capital Market Authority (CMA) and the Commodity Market headquarters. 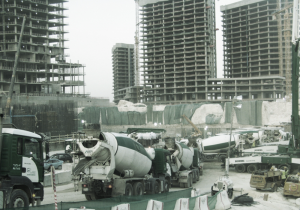 Due to the nature of lightweight aggregate, the concrete mix will exhibit high resistance to pumpability to higher level (high absorption nature of high porosity aggregate reduces the water amount that designed in the mix). Controlling the mix yield and maintaining the mix characteristics during delivery, handling and placing. Use of air entraining admixtures to maintain the air content as desired. High flowable grout was pumped through pipelines to insure full internal capsulation for pipeline to facilitate the pumpability and to control the maintaining of the mix characteristics during pumping process.